Vintage McCoy Pottery Antique Curio vase. c.1962. Very pretty matte white pedestal vase; it stands 5 tall x 5 wide; no chips or cracks, but does have some interior dirt residue, (someone apparently used it as a planter). Most of this has since been soaked out, but the exterior is fine anyway. 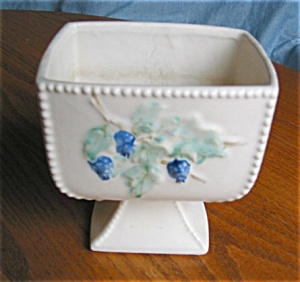 A very nice piece of McCoy pottery, and a great shabby chic item! It has mark #7 in the 1980 McCoy Book by B. Huxford. I also have the tall vase and the pitcher & bowl in this pattern for sale separately.